All our prints are produced on an Epson SureColor P9000 Standard Edition Printer 44 inch Ultrachrome printer using archival Epson UltraChrome® HDX ten-color pigmented inks. A selection of Epson Enhanced Matte, Epson Premium Luster, Epson Exhibition Canvas Satin and Matte, Epson Somerset Velvet, Epson Cold Press Natural are individually profiled using the Xrite EyeOne calibration tool. Controlled colour enviroment, production staff, file storage, digital copy work. A great combination of products and technology that ensure consistent quality results. Colour accuracy is determined using a GTI Print Viewer with day light balanced bulbs. To begin the process we need the image in our system. You can either use our FTP site or bring the image with you to our store (for more information about the FTP site give us a call). For a better result we recommend an image already scaled to the desired size and a resolution of 300 dpi. If your image or artwork needs to be digitized, QSQ offers custom hi-resolution scans from transparencies, negatives, or unmounted flat art. Scanning prices are based on the size of your original and the resulting file size. This phase include the cropping, resizing, and/or colour correction (this service is included in the price) if it’s required in order to match your image as close as possible. We can not guarantee an exact match, but we will do everything possible to bring your images to life. If your image needs a major photoshop work, we also offer the service of "Photoretouch, Photorestoration, Editing and Major colour correction). For printings (works) on paper, we leave an extra 0.25" white border to facilitate the mounting process. For Canvas printing we add 2" for stretching purposes. Once the image is completely adjusted we apply the proper profile (depending on the colour desired?). This process allows us to see exactly how the final printing is going to look on the surface selected (Canvas, Luster, Matte, etc...). When everything is ready we begin the printing process. We offer between 24 to 48 hours turn around depending on the quantity of images ordered. If the prints are going to be framed behind glass, we strongly suggest waiting a minimum of 72 hours. For those that are not going to frame their prints, QSQ offers the option of Foam core mounting. All of our stretching are done on site. This allows us to be closer to your requirements. Depending on how you're going to display your canvas (with framing or hung stretched as is), your options for stretching need to be considered before final printing. That is why we recommend any of these four options. Clear coating provides a 99% UV block as well as the necessary surface protection. It also provides sufficient protection for post embellishing or print enhancement. Is recommended for photographic and fine art reproductions that are going to be displayed without glass in order to protect the prints from the environmental contaminants. Clear coating is NOT optional for canvas output. At this point, your print is ready for pick-up. We suggest that you pick-up your prints in person, so that your invoice will be final at the time of pick-up. To produce our archival prints with amazing colour integrity, gloss-level, and scratch resistance we use Epson SureColor P9000 Standard Edition Printer. The 44-inch SureColor P9000 printer is a worthy successors to the revered Epson Stylus Pro 900 Series. Designed for professional proofing and photographic applications, they incorporate our latest imaging technologies – including an exotic Epson PrecisionCore® TFP® print head, along with our unique Epson UltraChrome® HDX ten-color pigmented ink set. Epson Intelligent High-Capacity Ink System — Eleven individual ink cartridges. SureColor P-Series printers are designed to work exclusively with specially formulated Epson inks, and not with other brands of cartridges or inks. Dries instantly for easy handling with Epson inks. Highest colour gamut available for vivid colour reproduction. 10 mil thickness for accurate photographic feel. Semi-gloss satin surface with a bright white point. Exceptionally high Dmax and wide colour gamut. Acid and Lignin free to preserve fine arts and photos. 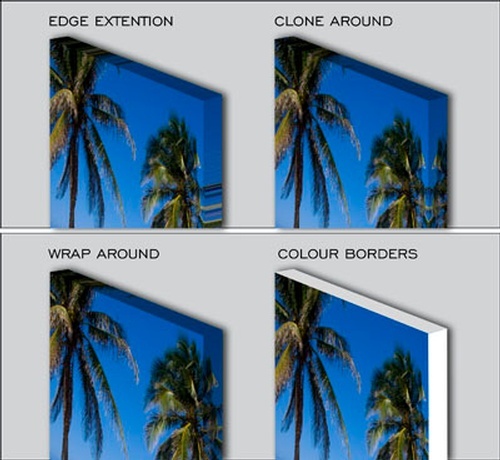 Enhanced with elastic polymers for gallery wrap stretching without cracking. Matte non-reflective surface with a bright white point. Velvet surface for fine detail and accurate reproduction. Acid free to preserve fine art and photos. 100% cotton hot press for long term durability. Outstanding D-Max for print with exceptional contrast. 100% cotton cold press for term durability. Mould-made in the traditional style. Additional Papers are available upon request. Our approach to High resolution scanning is not about the number of scans per minute, it's about scanning each image correctly. The original scan must take into consideration: hue, contrast, exposure and resolution. Our Epson Perfection V600 Photo scanner gives us the opportunity, not only to scan from transparencies, negatives, photographic prints or original artworks, but also to offer extraordinary quality and versatility with 6400 dpi resolution and an earth-friendly LED light source for greater productivity. In adition and with an extensive background and more than 10 years of experience on Adobe Creative Suite, we can process your image from the very beginning (RAW file proccesind, Photo-Retouch, Photo-Restoration, Colour Correction and/or Editing).